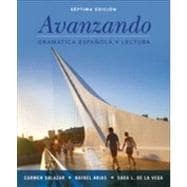 This traditional intermediate-level book organized by grammatical structure and a theme that reviews spoken and written Spanish grammar is updated to feature more balance in length and difficulty of grammar scope and sequence. It also incorporates updated vocabulary and topics covering new technology. Complemented by a selection of short stories by well-known Spanish and Latin American writers, this book presents grammar explanations and cultural presentations in straightforward, easy-to-understand Spanish with numerous examples, contextualized exercises and activities.